Known from two to three locations in Arunachal Pradesh in India: Turoo Hills (Das et al., 2008) the Delei valley and a valley in the Dafla Hills (Gajurel et al., 2006). Its presence in adjoining areas of China has not been confirmed. 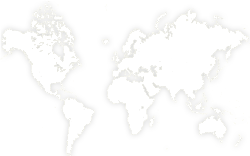 Known subpopulations are small and localised. Declines have been observed in one location. Occurs in warm temperate montane rain forest on north-facing slopes at altitudes between 1600 and 2000 metres above sea-level. These are 'mossy forests' dominated by Quercus spp., Castanopsis spp., Acer spp. and Rhododendron spp., with associated taxa such as Magnolia sp., Michelia sp., Corylopsis himalayana, Betula alnoides, Carpinus viminea and Exbucklandia populnea. Locally used for house construction (Gajurel et al., 2006). This species, as far as is known, has a small extent of occurrence (<1,000 km²) and a small area of occupancy (<300 km²), it is known from only two to three locations and there is continuing decline in the extent and quality of its habitat in at least some parts of its range. Hence it is listed as Endangered under criteria B1+2. Recent surveys (Gajurel et al., 2006; Das et al., 2008) have observed that in some areas this species is threatened by forest clearance associated with shifting agriculture ("jhuming"), localised exploitation for timber and firewood, infrastructure developments (roads and hydroelectric schemes). There is an urgent need to establish forest reserves as well as cultivation action to provide ex situ conservation for this species Further surveys are required to establish its full distribution and population size. Choudhary, R.K. (2008). A preliminary report on floristic diversity of Dihang Dibang Biosphere reserve of Arunachal Pradesh. Bulletin of Arunachal Forest Research 24(1-2): 29-34. Das, A.K., P.C. Nath & A.D. Khumbongmayum. (2008). 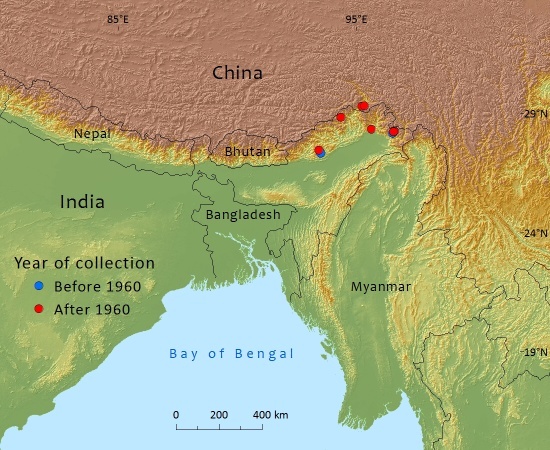 Distribution and population structure of Amentotaxus assamica Ferguson, a critically endangered and endemic species in Arunachal Pradesh, India. Indian Forester 134(1): 97-104. Ferguson, D.K. (1985). A new species of Amentotaxus (Taxaceae) from North Eastern India. Kew Bulletin 40(1): 115-119. Gajurel, P.R., P.J. Bora, J. Muthu & A. Sarmah (2006). Status and conservation aspects of Amentotaxus assamica - a critically endangered gymnosperm in Arunachal Pradesh, Eastern Himalaya. Phytotaxonomy 6: 39-44. Haridasan, K. (1988). Amentotaxus (Taxaceae) - a rare gymnosperm from Arunachal Pradesh. Indian Forester 114(2): 868-870. Menon, S., R. Gil Pontius, J. Rose, M.L. Khan & K.S. Bawa. (2001). Identifying conservation-priority areas in the tropics: a Land-Use Change Modeling Approach. Conservation Biology 15(2): 501-512. Sahni, K.C. (1990). Gymnosperms of India. Bishen Singh Mahendra Pal Singh, Dehra Dun. Ved, D.K., G.A. Kinhal, K. Ravikumar, R.V. Sankar & K. Haridasan. (2005). Conservation Assessment and Management Prioritisation (CAMP) for wild medicinal plants of North-East India. Medicinal Plant Conservation 11: 40-44. P.Thomas,and Lianming Gao, 2016. Amentotaxus assamica, from the website, Threatened Conifers of The World (http://threatenedconifers.rbge.org.uk/taxa/details/1052).